When we think of Mark Twain we think of humor and picaresque journeys around the American landscape. For Mud, we are given a modern Twainesque tale set in an Arkansas river town where young teenagers see the complexities of love and crime first hand. Ellis (Tye Sheridian) and Neckbone (Jacob Lofland) are two junior high aged young men who travel across a river to reach an isolated island. As they venture inside the island’s forest, they come upon a boat hoisted in the trees. 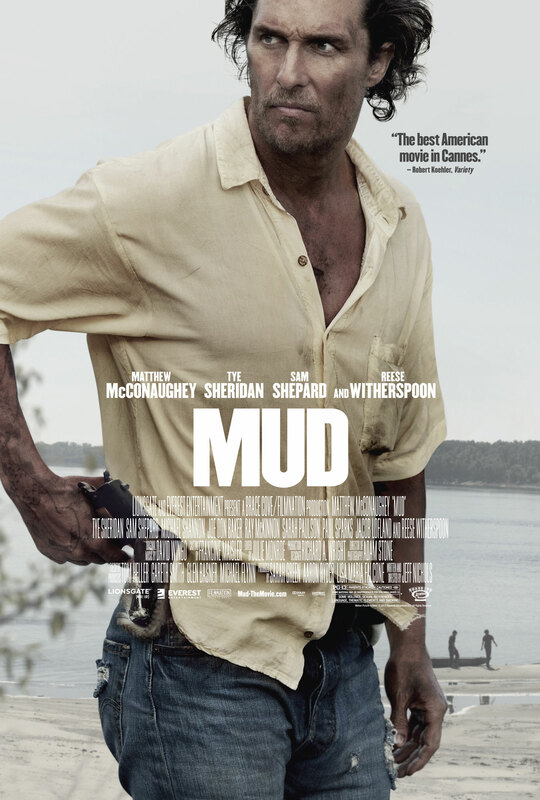 Mud (Matthew McConaughey), a fugitive from a murder, is hiding out on the island and has also claimed ownership of the boat in the trees. Malnourishment has left his cheekbones protruding, and his chipped tooth points to the scars from his past, but he might as well have a chip on his shoulder. 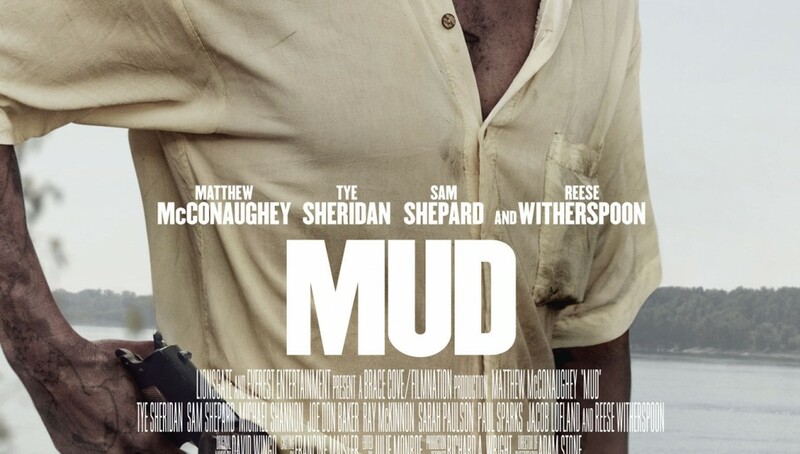 Mud has made a deal with these children, help him get that boat down and running and help him get his girlfriend Juniper (Reese Witherspoon) to the island so they can run away, and in return he will give them his .45 pistol. Not only are the authorities looking for Mud, but so is a rather unscrupulous gang of men with a blood vendetta. It is an unlikely relationship that has brewed between two easily influenced children and Mud. But Ellis is of that age when women become an attraction and love is so easily defined by his environment. Ellis’s carnal instincts are developing much more rapidly than Neckbone, but he is also realizing that love and affection might be more complex than a fugitive on the run. Ellis’ parents are at the early stages of divorce, a decision that will ultimately give his mother the right to allow the river authority to put their riverside home under eminent domain. Essentially, Ellis sees that Mud’s love for Juniper has led him all across the country, and is strong enough to kill a man. It is this romance, if you could call it that, that intrigues Ellis since the love that surrounds him is either out of reach or breaking a part. Not too long after hearing about Mud’s romantic ideals to run away with Juniper, Ellis begins to mirror this love at all cost romanticism. He winds up punching a Senoir year high school student to woo the interest of May Pearl (Bonne Studivant) who is also much older than Ellis. This budding romance for both Ellis and Mud respectively has led them down roads of unrequited loves, or at least love out of reach. The boat that is held up in the trees might be the accurate metaphor for love in this film; the tree’s arms represent an unobtainable object of desire. The boat also points towards such surreal films of desperation such as Aguirre: Wrath of God, where boats and ships are lodged high up in the canopy, with little logical explanations on how they got there. Yet, there is a Mark Twain influence where children have a casualness to their dialect and humor. This coming-of-age and becoming an accomplice drama portrays a riverside town that is tied to an industry dependent on the river, although one of the subplots involving the Ellis home’s deconstruction by the river authority is untouched, as is the corruption between the local police and the gang that rides into town looking for Mud. Despite the dusty working-class town aesthetic, both Ellis and Neckbone have a sensibility in them that is sometimes as mature as adults. Wes Anderson’s Moonrise Kingdom explored this aspect of two children expressing their idea of love while the real adults run amok, Mud tends to portray Ellis in the same fashion, minus the storybook form. Despite the danger these two boys have gotten themselves in, they go about it with humor and sensibility that the adults seem to have lost. Director and writer Jeff Nichols has crafted a film that is much like his previous, Take Shelter. There is overwhelming sense of doom on the horizon, with an ending that feels like a compressed version of Straw Dogs. The film collects a rhythm tied to the tides of the river, where the highs and lows are in parallel with Mud and Ellis’ love. Of course the film really challenges our insistence on following children who have aligned themselves with a fugitive, but the question for the audience is just the same: do we also align ourselves with a character that has killed for love and rescued the abused?